ALTON TOWERS HAS run into another controversy after a group of visitors were left hanging upside down on the hottest day of the year. The incident happened on its Air rollercoaster, which stopped halfway through its run leaving riders hanging upside down for 20 minutes. Yesterday also saw the breakdown of two of the the theme park’s monorails, leaving 80 visitors in the air for around an hour. This happened at around 5.30pm when a sensor was activated on one of the trains. The second train stopped automatically as a response to this. Alton Towers has aplogised for the incident and has said that the affected monorail train has been taken out of action pending an inquiry. It is also said that guest on the monorail were kept informed of the developing situation via the ride’s PA system. Yesterday’s breakdowns follow the park’s ‘Smiler’ rollercoaster crashing into an empty carriage at the theme park last month – an incident that saw a 17-year-old have her left leg amputated above the knee. Email “Alton Towers breakdown leaves visitors hanging upside down ”. 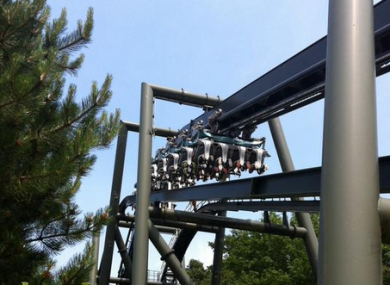 Feedback on “Alton Towers breakdown leaves visitors hanging upside down ”.